Griffin Ranch was once acreage on the personal estate of Merv Griffin, located in the La Quinta area. 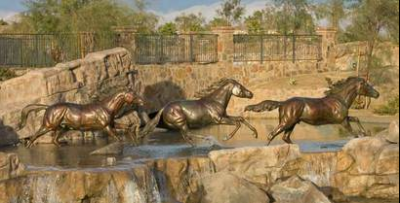 The Griffin Ranch, made up of 242 acres, offers a master community created to please equestrian lovers. The equestrian theme will suit those who have a love of horses and also those who are looking for a more sophisticated setting. The community began it open selling on May 2007 with the first community homeowners taking residence in November of the same year. This gated community offers a guarded entry way. The Griffin Ranch has a collection of four residential units each offering 14 floor plans of single story residences. These four designs are know as the Campania Collection, Castilla Collection, Madeira Collection, and the Sevilla Collection. The architectural styles are much sought after and show off the Monterey, Spanish Colonial, Andalusian, Italian Farmhouse, and Contemporary Mexican designs. Each interior offers not only the best in quality details but also have interiors that range from 2,609 square feet to a wonderful 5,629 square foot home offering the choice of a three or four bedroom layout. A few unique plans can accommodate a library, wine rooms with a walk-in design, vaulted ceilings, wet bar, courtyard, tiled entry way, detached casitas, and loggias. Kitchens of Epicurean style are created by the use of wonderfully spacious islands, counter tops of granite, cabinetry designed by Euroline, butler’s pantries, walk-in pantries, top of the line GE appliances, and morning rooms. The Griffin Ranch La Quinta also provides twenty of the most beautiful one acre home sites for those who have their personal custom designs in mind. Each is perfectly located around the personal estate, the home sites are some of the more desirable locations for those wanting to build the home of their dreams. The community has some enhancements in the works that will definitely impress you. The first being a full service facility for equestrian use known as the Saddle Club. It is will be set inside the Griffin Estates with construction beginning soon. The Saddle Club will offer top of the line arenas, riding programs, a clubhouse for horse lovers, riding pastures, 24 hour supervision, and enough space to board up to 80 horses. Once this structure is complete, the residents of Griffin Estates will be able to enjoy one of the best horse facilities that Coachella Valley has to offer without leaving home. The more private and exclusive Griffin Club will be constructed to accommodate over 24,000 square feet of clubhouse and offer the finest amenities a club can give. The members will be able to enjoy a wonderful recreational and social environment along with the finest dining, fitness center, tennis facilities, swimming facilities, and services for personal care. The backdrop for all of this is the beautiful mountain ranges that trim Griffin Ranch. Residents can experience some of the best in world class life offering them a sophistication and ambiance desert buyers are yearning for. With the influx of new residents and the fact that the amenities are now being set into place, the Griffin Ranch is starting to become one community that is just as Merv himself loved and dreamed about. It is truly a unique desert community. The development of Griffin Ranch is being completed by MG Ranch Land and the La Quinta-based Trans West Housing. The late Merv Griffin founded the MG Ranch Land as his own real estate company. If you would like to see property at Griffin Ranch, please call us at the numbers below. Were committed to helping you find the home of your dreams.